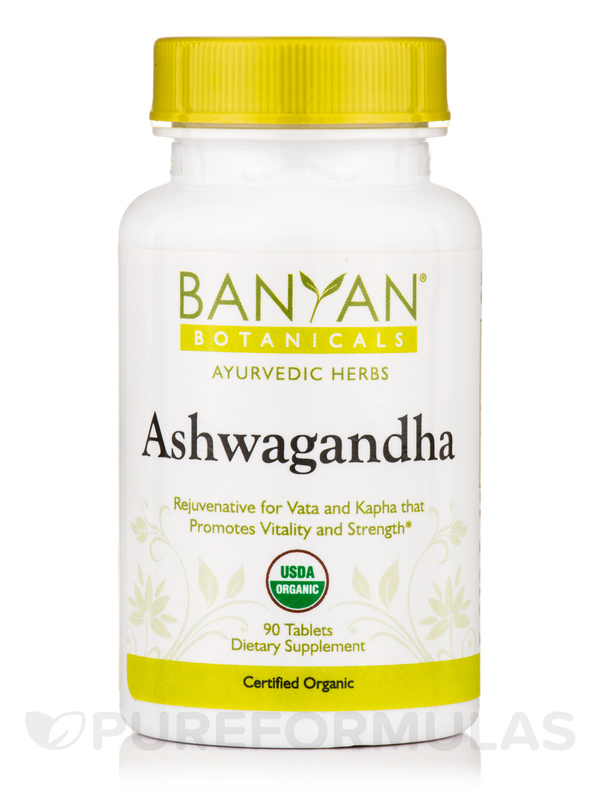 I have been taking Banyan Botanicals Organic Ashwaganda and find I have more energy during the day and sleep very well waking up feeling really refreshed. 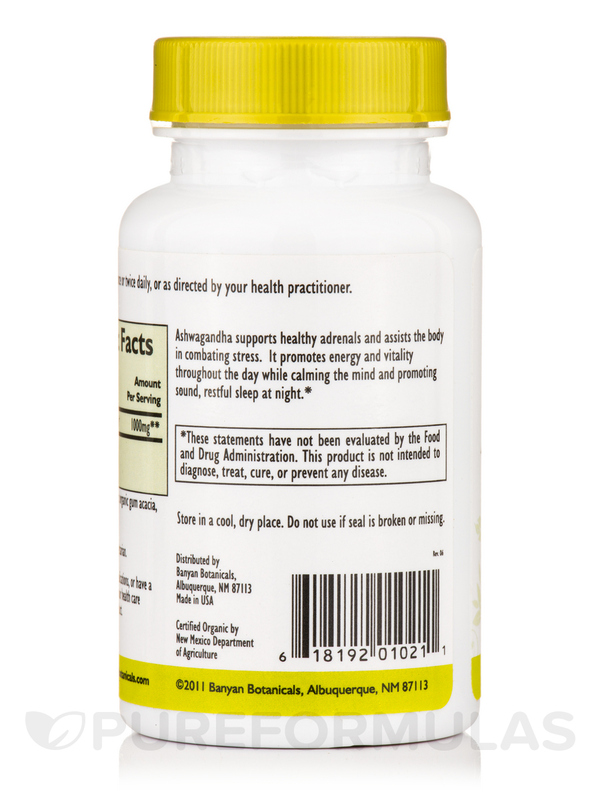 I have been using Ashwagandha (Organic) for about four months. I saw it on the Dr. Oz show and they mentioned it helped with menopause symptoms. It really does help especially when used with the Estrovera. Ashwagandha is one of the most highly regarded and commonly used adaptogens in the Ayurvedic pharmacopoeia. Maximizing the body's ability to resist stress‚ it enables the body to reserve and sustain vital energy throughout the day while promoting sound‚ restful sleep at night. It is considered one of the best herbs for calming vata and for revitalizing the male reproductive system. Used by both men and women‚ it maintains proper nourishment of the tissues‚ particularly muscle and bone‚ while supporting proper function of the adrenals. This potent herb is used to promote muscle strength and to support comfortable joint movement. It is also used to maintain potency and a healthy libido‚ for it is said to bestow upon its user the vitality and strength of a horse. As a rejuvenative‚ Ashwagandha is particularly useful to seniors and for anyone that would benefit from a nourishing‚ natural source of energy. - Increases energy and vitality. - General adaptogen for combating stress. 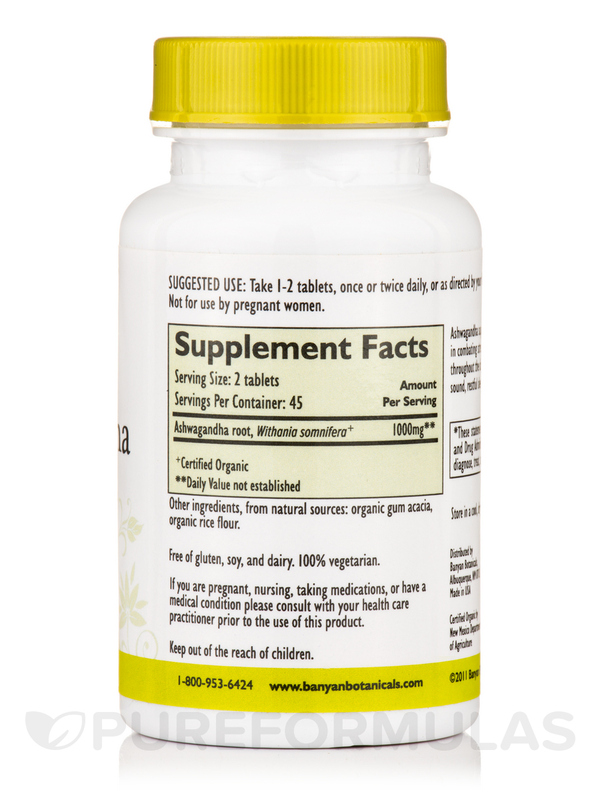 - Assists in calming the mind and promotes restful sleep. 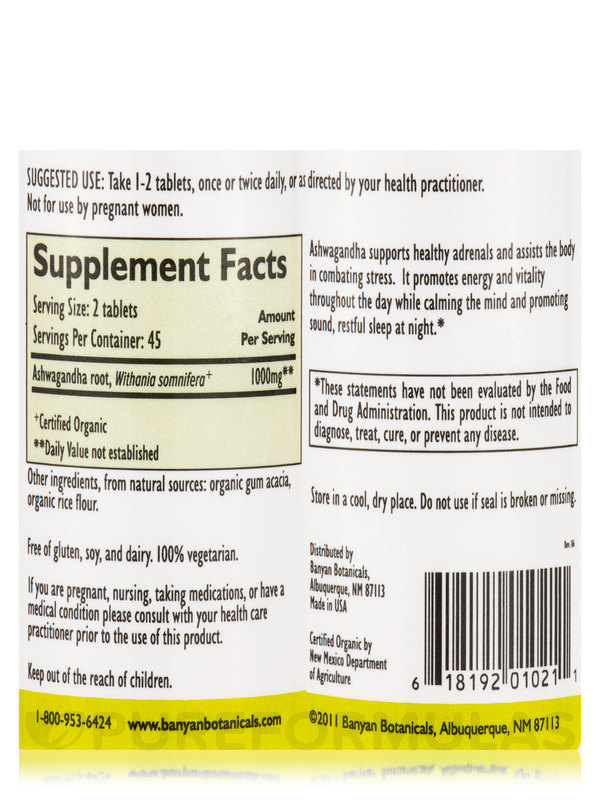 - Supports proper function of the adrenals. Other Ingredients‚ from natural sources: Organic gum acacia‚ organic rice flour. Free of gluten‚ soy‚ and dairy. 100% Vegetarian / USDA Organic / Made in USA. Take 1-2 tablets‚ once or twice daily‚ or as directed by your health practitioner. Not for use by pregnant women. If you are pregnant‚ nursing‚ taking medications‚ or have a medical condition please consult with your healthcare practitioner prior to the use of this product. It takes away my anxiety. I saw Ashwagandha on Dr. Oz and decided to try it. It works I am sleeping so much better and seem to have more energy. I will order Ashwagandha again. I have been taking Ashwagandha for a week now and first thing I noticed I am more calm and respond more smoothly to stress. I also sleep much deeper and longer waking up more refreshed as a result. All in all its an herb all natural/ Really good stuff. Low price makes it more affordable.